Night two of Unk and Miss Dorothy’s latest Chiefland odyssey did not look like it was going to be too productive, muchachos. Clouds had been building all day, and the consarned Clear Sky Clock only looked good if’n you fancy little white squares. I tried not to worry. What would be would be, and our first night, Wednesday night, night one of The Herschel Project Phase Two was dyn-o-mite, as I told y’all last week. No, Unk didn’t worry; he just enjoyed the day with Miss D. After a breakfast at the Day’s Inn that, for Unk, consisted of not one but two (small) sausage biscuits and a make-it-yourself waffle on which he dumped about a gallon of Log Cabin and a pound of margerine, we headed off on a new adventure, to Fanning Springs State Park, just a few miles back up Highway 19 from Chiefland. What we found there was a small but beautifully maintained Florida park. The pretty emerald green springs were full of fish, mainly mullet like we’d seen at Manatee Springs the day before, and we spent quite some time walking the trails of the lush and verdant place. Off season, it was mostly just us and the park rangers, which was cool. 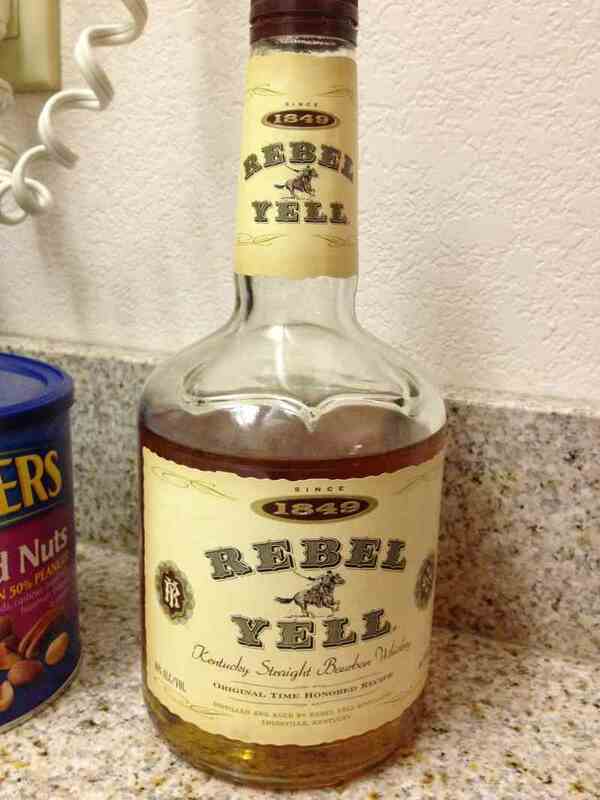 Your old Uncle sure was in the mood for a little of that blessed peace and quiet. There’s a boardwalk at Fanning Springs just like at Manatee Springs that leads down to the river, and by “river” I mean the beautiful Suwannee River. 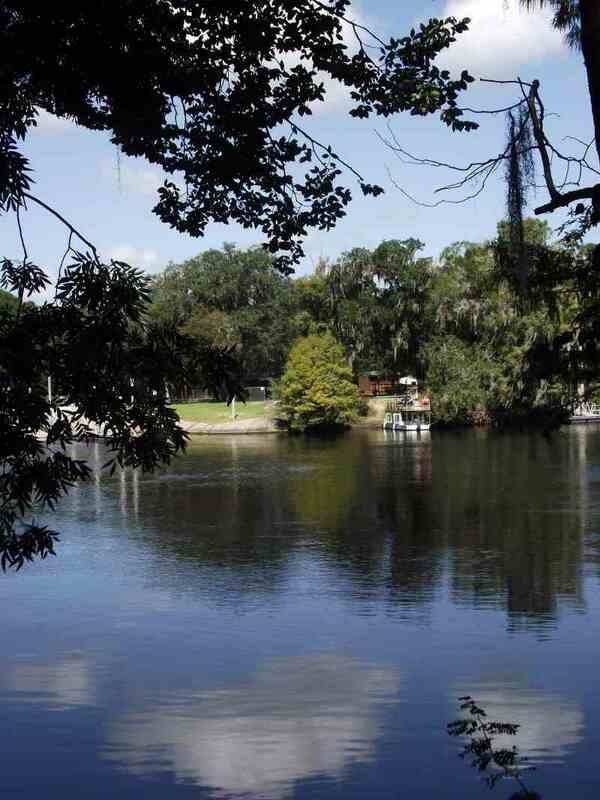 Unlike at Manatee Springs, access to the river bank is easy, and Unk couldn’t resist going down and dipping a hand in the Suwannee so he could say he’d touched those fabled waters of song and story. After an hour or so of strolling Fanning Springs, it was time for lunch at a new spot, the 1998 grill back out on Highway 19 less than a mile from the park entrance. We’d heard our fellow Chiefland Astronomy Village denizens raving about this joint for the past year and decided to give it a try. Unk wasn’t sure what we’d find or even what the name of the place, “1998,” meant. Price? Year? What? This little eatery, it turned out, was named for Highway 19 and Highway 98, which run concurrently in the Fanning Springs – Chiefland area. “19/98 Grill,” get it? 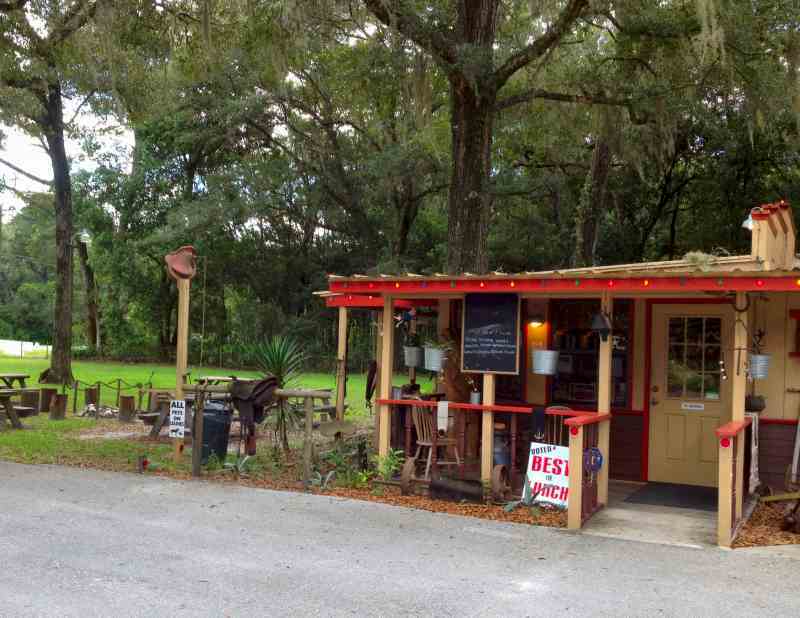 It’s small, it’s rustic, and it operates on the pub system Unk and Miss D. have enjoyed in the UK. Go up to the counter, order what you want, they bring your victuals to your table when they are ready. The question was “What should they bring?” For such a wee place, the menu was freaking EXTENSIVE. 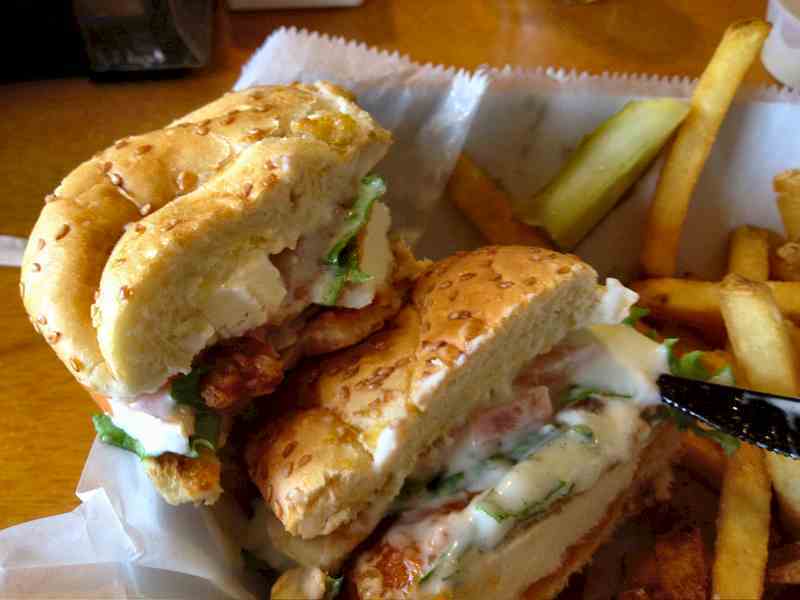 Unk was a little muddled by all the choices, and ordered an old standby, a buffalo chicken sandwich with a side of blue cheese and fries. Miss D., following Unk’s distinctly non-healthy lead, got a chili cheese dog. When the food arrived it was immediately obvious why the place was getting such a good reputation and why it was well on the way to standing room only on this Thursday lunchtime. Not only was the food that arrived attractive, it was some kind of good, campers. I got the tip-off it would be something special when I opened the container of blue cheese. Thick, fresh, full of chunks of real cheese. The chicken was wonderful, crispy but juicy with just enough buffalo taste, the lettuce and tomato seemed to have been picked that morning, and the bun was moist and similarly fresh. The fries were every bit as good, but I limited myself to just a few, since my poor stomach was already beginning to protest the rich/junky fare of the past two days. Our verdict? We will dine at 19/98 every CAV trip from now on. After that stellar meal it was time for a long nap, natch, followed by some strategizing. By late afternoon, the sky wasn’t looking bad. Sure, there were clouds, but they appeared to be more of the fluffy afternoon variety than of the impending severe weather species. 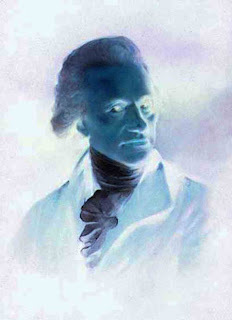 I did not, however, think there would be much chance of doing more Herschel sketching. Looked like “catch as catch can” at best. So what would I do? 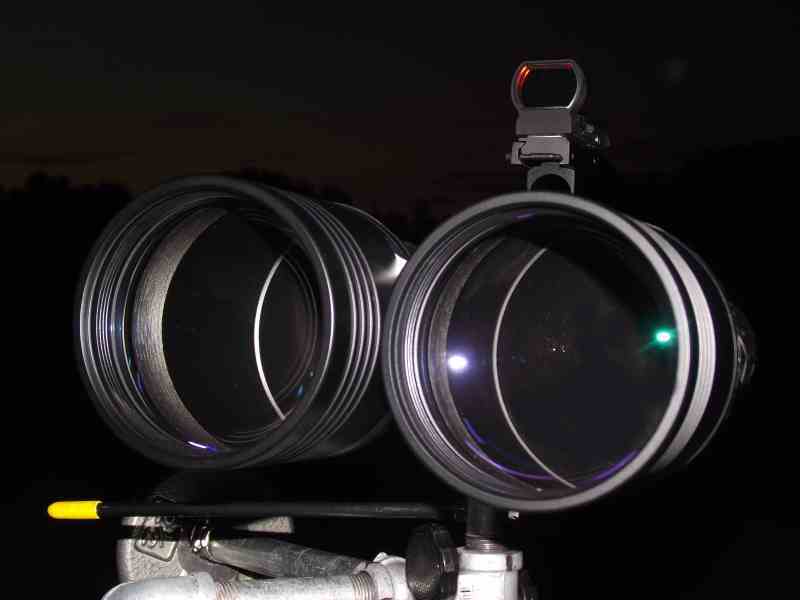 Maybe I’d give my uber giant binoculars a night under the stars—finally. By “giant” binoculars, I mean real giants, 25x100 big dogs. I’d got my Zhumell Tachyons a year back, but had done next to nothing with them other than giving them and the binocular mount Dorothy and I built for them a quick try in the front yard of Chaos Manor South. Three things got in the way, you see: The Herschel Project, The Mallincam Xtreme, and the past spring and summer’s horrible weather. 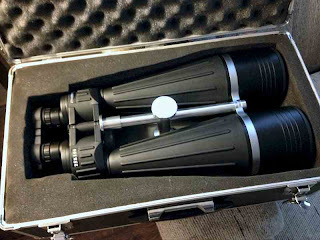 My giant binocular story began when I read a pair of reviews good buddy and binocular guru Phil Harrington wrote about the huge Zhumells his wife had given him for his birthday. In a Cloudy Nights posting and a more detailed Astronomy Magazine review, Phil fairly raved about their quality, especially considering their miniscule price, less than 250 George Washingtons. I’d been wanting a pair of glasses with more oomph than my time-honored Burgess 15x70s, and if Phil liked the Zhumells, I was pretty sure I would too. 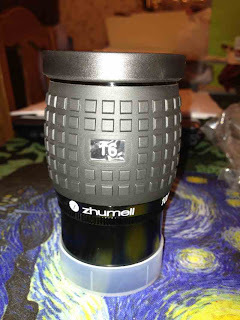 I had a few extra bucks burning a hole in my pocket at the time, so I sent ‘em off to Zhumell dealer binoculars.com and set about making plans to accommodate the monsters. I knew good and well I wouldn’t hand-hold glasses of this size and weight (ten pounds plus). I had a hefty camera tripod that would be sufficient for initial checkout, but I also knew that would not work well for real observing. 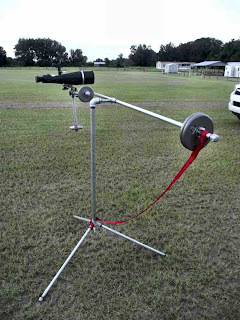 A standard photographic tripod, even a tall, heavy one, is not sufficient for binoculars of this size, especially those, like the Tachyons, with straight-through eyepieces. In addition to breaking your neck when you are looking much above the horizon, the motions are never easy and smooth enough for astronomical use. Balance? Nearly impossible. 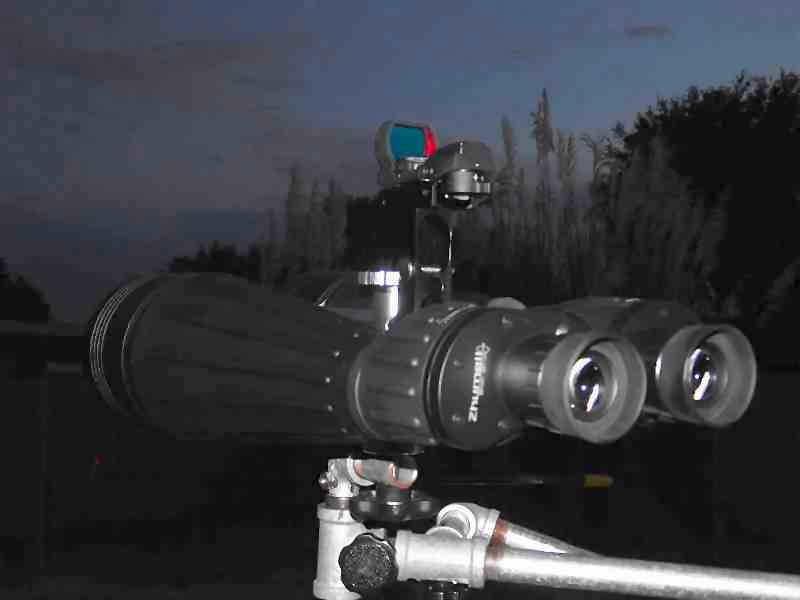 There are plenty of big binocular mounts, everything from “parallelogram” mounts to an innovative rig that uses a mirror to reflect the sky into the binocular’s objectives. Both these approaches were problematical for me, though. 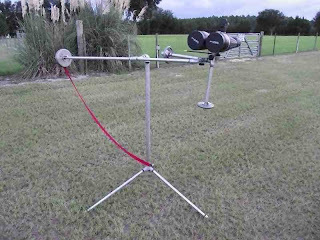 Parallelogram mounts in sizes large enough to accommodate 25x100s were expensive once you figured in the cost of the tripod sufficient for them, and the mirror mount looked like it would dew up instantly in the Possum Swamp humidity. I did some more looking around and asking around and came up with another possibility, a mount designed expressly for monster binocs that was sold as a kit for a reasonable sum. 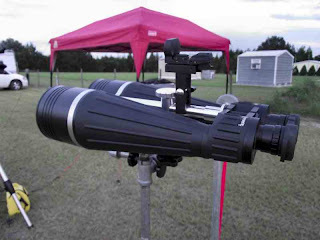 The dude selling this mount was one whose reputation I knew, Pete Peterson, who’s quite famous in the Meade world for his upgrade kits for LX200s. Even Celestron fanboy me has a Peterson product, an “Eye Opener” big back for the 3-inch rear port on my NexStar 11 GPS (Pete no longer makes these for Celestron scopes, unfortunately). His binocular mount? It was in essence a pipe mount, something I was intimately familiar with from my days as a starving teen astronomer. The EZ Binoc Mount kit, the web site informed me, came with all required custom items like specially threaded/welded/drilled pieces, assorted hardware, a tube of valve grinding compound, and detailed instructions. The buyer would supply the pipes needed to complete the device. The fare? About a hundred bucks for the kit plus sixty more (or so depending on where you buy your galvanized pipe) of user-furnished stuff. 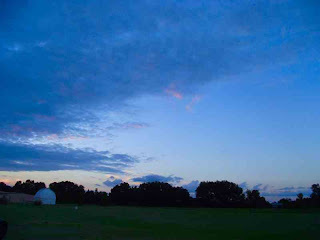 I read the reviews, not just on Pete’s site, but on other I-net astronomy venues, and was favorably impressed. I decided that if the binoculars that arrived were good, I’d go with Pete’s somewhat Rube Goldberg-ish looking contraption. What was inside impressed me just as much as it had Phil. Big, and I mean BIG binoculars with a rubber armored body and a strong central shaft with a hefty tripod mounting post. I did note, as Phil had, that the central shaft had a little side to side play in it, but, also as he had, I didn’t think it would cause much—if any—problem. The big objectives? Greenish multi-coated things of beauty. The eyepieces seemed nice, too, with a decent AFOV and, I noted, threads for standard 1.25-inch filters. As is the case with most giant binocs, the eyepieces focused separately in helical fashion. My strongest impression, though? How heavy the things were. They come in at a bit over 10 pounds, but seemed more like 20 when I lifted them out of their case. Well, that was OK; I had the option of ordering Pete’s mount if these things seemed worthy. 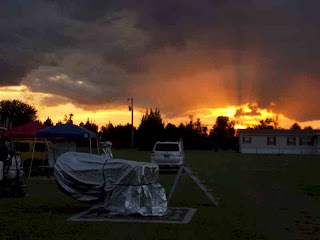 I was lucky that there would be a public outreach session at The Possum Swamp Astronomical Society’s, in-town site the very next night. I’d haul out a big tripod and the Tachyons and find out how good the optics were. When our young guests had scurried off, I shut down Cindy Lou, my RV-6 Dynascope reflector, which is my frequent public outreach scope, and got out the Tachyons. 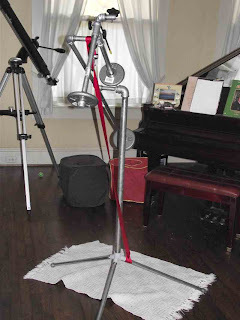 Put them on the tripod and endeavored to get them pointed at the Moon. And just as quickly removed them. Too hard to balance. Too hard to get my eyes at the eyepieces. As I’d figgered, a photographic tripod of any kind simply would not do. But I still needed to check their optics. I did that by seating myself in a lawn chair, bracing my arms to the extent they could be braced, and pointing these monsters at the Moon by hand and by force of will. The Moon was a lovely, warm-looking, cratered masterpiece. 25x is more than enough to reveal plenty of details. The images, once I, by hook and crook, managed to focus, were very sharp, chromatic aberration was minimal. Pointing at a nearby star field revealed impressively sharp stars across the 3-degree field. Next morning I sent Mr. Peterson my credit card number. Even if I hadn’t dealt with Pete before, I’d have had a good impression from the get-go. Shortly after I ordered, I received a detailed email telling/showing me the parts I needed to buy to complete my mount. I bopped down to Lowes one afternoon on the way home from work and was able to get all the pipes and connectors in one go. I probably could have saved some money by dealing with a pipe supply company, but Lowes was convenient and Unk is, as you know, even lazier than he is stingy. In a remarkably short period of time, the box from Peterson containing the custom parts and instructions was at the old manse and I was ready to give it a go. Frankly, I was a little nervous if not scared looking at all those strange parts accompanied by the ones I got at Lowes. The cats were extremely suspicious. I decided I would not freak out; I would just follow Pete’s illustrated instructions step by step. And what excellent instructions they were. Unlike some folks offering similar kits, Pete does not assume you know anything about the parts or procedures involved in putting the EZ Binoc together. He leads you by the hand and was even able to get old fumble-fingered Unk going. One good thing? I knew I was on unfamiliar ground and gritted my teeth and followed the directions exactly, something y’all know I am usually loath to do. Amazingly, I didn’t run into any real problems. Not for a while. Assembling the mount in the front parlor like Unk did is not recommended, however, if for no other reason than that the valve grinding compound you will use to smooth the threads on the rotating joints of the mount is the devil’s own brew. The stuff looks harmless enough, but it propagates. A tiny pinch spreads everywhere. Despite being a teenager, li’l Unk nearly got a bad spanking from Mama when he walked into the den with his good school clothes covered with the black stuff after putting together the pipe mount for his homebrew 6-inch Newtonian. I was wary of the valve grinding stuff and used extreme caution while applying it to threads, working it in, and removing it from same. I had learned my lesson long ago. I was positively humming along, y’all, with the mount really beginning to look like something, even if that something could be best described as a plumber’s nightmare. Till I ran aground just as I was finishing up. 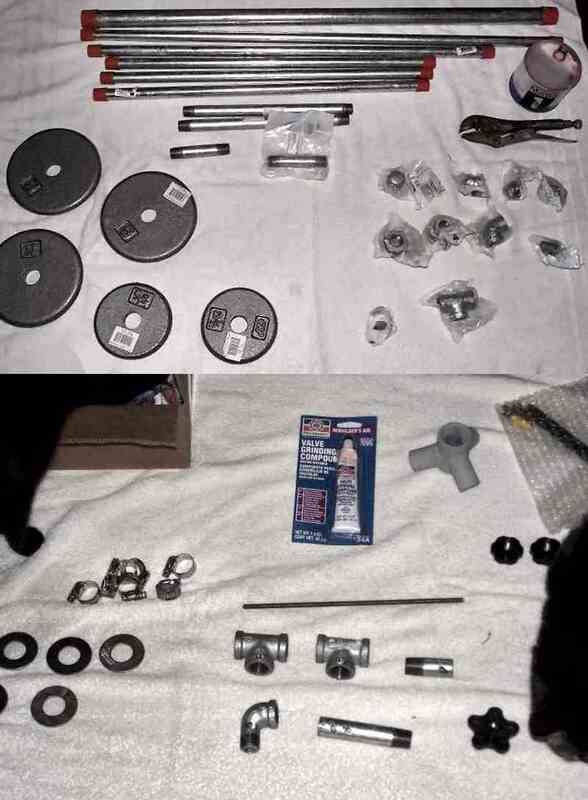 I had purchased the recommended five and ten pound barbell weights at Academy Sporting Goods and had put them in the right places, but when it was rubber meets road time and I mounted my Tachyons on the thing, it would not even come close to balancing. As soon as I let go, the binoculars headed for the ceiling. Removed one 10 pounder and they sunk toward the floor. Was I sunk? No. Miss Dorothy whipped out her calculator and did the math to get me out of the mess I was in. She not only determined which section of pipe on the main strut needed to be replaced, but how long that replacement should be. I stopped at Lowes one last time, got a shorter pipe, screwed it on in place of the original one, and all was well. The main strut balanced perfectly with barbell weights on one end and the binoculars on the other. With the friction locks just barely engaged on the binoc end, the Tachyons balanced perfectly, seeming to float in mid air. A little maneuvering around in the house showed the motions to be smooth to the point of buttery. The only true test of astro gear is under the stars however. It being a weeknight with a gibbous Moon in the sky, the best I could do was the front yard, and I hauled the mount out there as soon as a few bright sparklers winked on. Mounted the binoculars and got to work. What I found was that the EZ mount was a wonder. Its incredible freedom of motion, all those various axes that make it look like a plumber’s nightmare, means the binoculars can be pointed almost anywhere in the sky without making you crane your neck, hunch over, or stand on tippy toes. When you’ve got your mount together, you will be dumbfound as I was out in my front yard on that mild spring evening that such a simple and homely thing can work so well. Some folks have wondered whether one of the moving joints might unscrew—there is nothing to prevent the main strut from unscrewing from the stand after all, causing disaster. In practice, this is not a problem. The only joint that is likely to unscrew is that one on the main strut, and as long as you remember to move clockwise on that axis whenever possible, there will never be a problem. The binoculars themselves? When you are dealing with relatively high power (for binocs), 25x, focus and other adjustments become more critical than with small glasses, especially if your eyes tend to have trouble merging objects in binoculars and binoviewers of any kind like mine do. I found interpupillary spacing (separation of the two eyepieces) needed to be just right, but when I’d done that and my eyes had a moment to acclimate, stars, including bright ones, became nice pinpoints. What else? Naturally, the Moon again proved to be a wonder with these binoculars. Saturn was in the sky, too, and it turned out that 25x was indeed enough to (barely) resolve the ring, with the golden planet looking simply amazing despite its small size. What wasn’t marvelous? Getting the binoculars aimed at Saturn. Clearly, at 25x you gotta have a finder. I lucked out finder-wise. I already had one of them new-fangled Chinese red dot jobs, you know the ones that let you select various reticle shapes. All I needed was some way to mount it on the Tachyons. It didn’t take long to find perfection, even if it wasn’t cheap. Garrett Optical had a bracket for this very finder that would clamp onto the glasses’ central bar. It was 50 bucks, but looked better than anything else I found. I ordered it. After that? Nothing. Not for over a year. Once the basic observing for the Herschel Project was done, though, I began to think about my binoculars again. And sometimes the stars and planets are in just the right alignment. As I told you-all last week, I was exhausted prior to me and Dorothy’s just-finished Chiefland expedition. The weather was a factor, too. Even if I’d felt like doing serious imaging, it didn’t look like the sky would cooperate. What to do? 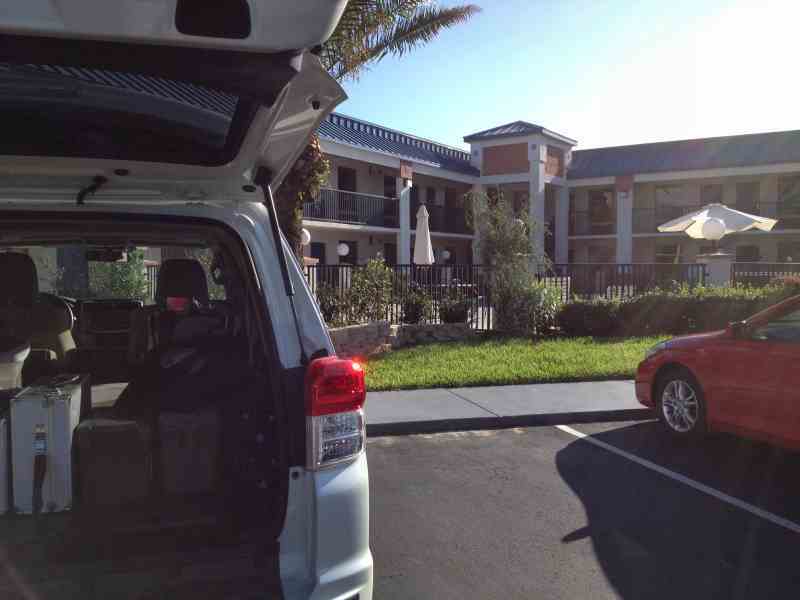 I packed the Tachyons and the EZ Binoc in the 4Runner with the C8. Wednesday night, our first night down Chiefland Way, was devoted to sketching Herschels and not much else. It appeared the weather that night would be the best we could expect for the trip and I wanted to take advantage of it. The Tachyons stayed in their case. Thursday? I wasn’t sure we’d see anything—not according to the dadgum Weather Channel. 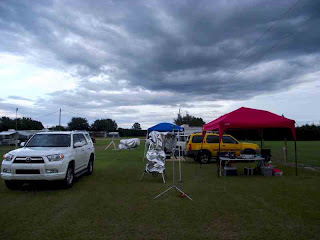 By the time 7 p.m. rolled around, I was ready to hit the old observing field no matter what the consarned weatherman said. And I had hopes. The clouds that had been thickening all afternoon were suddenly beginning to scamper off in the direction of the Gulf of Mexico. Maybe, just maybe. I uncovered the C8, Celeste, since I wanted to try another go-to alignment with her Atlas mount’s new software, but the main course would be the Tachyons. First order of bidness was getting the EZ Binoc set up. Despite me having made some marks on the mount’s rotating joints with a magic marker, I was soon confused about what should be positioned where. Luckily, I’d had the good sense to take iPhone pictures of the thing when it was correctly arranged in the living room the Saturday before our departure. With the aid of the pix, the Tachyons were soon on the mount and ready to go. When the first stars blinked on, I set the interpupillary spacing for my eyes, focused up, and waited for the riches of Sagittarius. Which arrived right on schedule in concert with a sudden and dramatic clearing to the south. When the Milky way began billowing up out of the Teapot’s spout, I got the binoculars pointed that-a-way and began drinking in the marvels. First object? Good old M22, the great globular star cluster adjacent to the Teapot’s lid. It wasn’t quite resolved—it wasn’t quite dark yet, either—but it was big and it was beautiful. Again, I marveled at how well the silly looking mount worked. I never stooped or strained, even when pointing near the zenith. Movements were crazy smooth and precise. While there is a wee bit of springiness in the mount, vibrations settle out quickly. Pete makes a larger mount kit, the EZ Binoc Super Mount, but I am entirely happy with the standard model. “Happy” does not begin to describe how I felt when astronomical twilight arrived. I had never seen the Milky Way like this. From my first target after M22, M8, the Lagoon Nebula, I was in heaven. The stars across the big field were numberless, sometimes resolved, sometimes appearing like nebulous clouds. The real nebula in M8 was starkly visible along with the dark “lagoon” lane. The tiny stars of the superimposed open cluster, NGC 6530, were hard little pinpricks, but that was not the draw. The draw was the 3-D effect. As my eyes became accustomed to the Tachyons, I began to see that some of the stars involved in the nebula, especially those in the dark areas, were actually behind the gas cloud, farther away. This has no basis in reality, of course. The baseline between my eyes was not nearly long enough to provide real 3-D on an object at least 3,000 light years out in deep space. But that’s not what my brain thought. It decided that since I was looking with two eyes, I must be seeing depth. Though not real, this faux 3-D effect was striking and startling. Other optical characteristics of the Tachyons? Yes, if you point ‘em at a bright star as I did at Vega, there is chromatic aberration, but it is fairly subtle and non intrusive, appearing more as a gray haze around the star than as the dread Color Purple. Not that I spent much time worrying about such things. 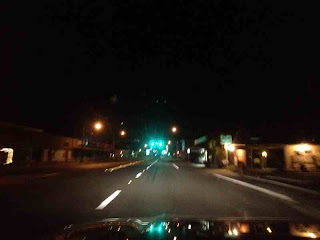 The whole road of the Milky Way from south to north was open before me and the Tachyons. We put a foot in it and were, as J.R.R. Tolkien’s Bilbo Baggins warned, swept away. I did occasionally go over to poor Celeste to view some objects in the SCT for comparison, but basically it was binoculars all the way all night, or for as long as the sky lasted, till about 12:30 in the a.m.
M22. As astronomical twilight comes on, I can now see the occasional star pop out around the cluster’s periphery. Set in a crazy-rich field. The 3D effect is very noticeable. M8 and M20 are in the same field and incredible. The dark lane, the “lagoon,” is prominent. The huge field is just full of resolved and unresolved stars, clusters, and nebulosity. I was surprised to see that M20, the Trifid, at least hinted at its lobed nature occasionally at 25x, but it dern sure did. The open cluster just to the northeast, M21, is lovely, like a handful of gems thrown up into the dark night. M17, The Swan, is small but awesome. The Swan shape is easy. I’m beginning to pick up some of the outlying nebulosity, too. Here in the main stream of the Milky Way, the background is crowded with stars. I wasn’t sure I’d see anything of the Eagle Nebula, IC 4703, surrounding M16, but here it is. I’m seeing the cloud involved the open cluster easily, and at times the eagle shape is evident. In the 25x100s, M11, the Wild Duck is a thing of wonder. It is a little small, but impressive nevertheless. A few brighter stars are resolved, but the overall effect is like Hubble’s Variable Nebula, a comet shape with a brighter star as the “head.” Although the cluster was nearly overhead, I had no problem viewing it with the EZ Binoc Mount. Back down south to catch M7, the Ptolemy cluster, a glittering sea of sapphires. It’s too big for most telescopes at 80’ across, but it just fits into the Tachyons’ field. What do I think? “Awesome, incredible.” I am wearing out those words, but the southern sky is just that in these binoculars. M6, the Butterfly Cluster, M7’s neighbor, is really better for big binocs or telescopes than M7, since it’s a much more compact 25’ in size. I usually have a hard time seeing a butterfly here, but with plenty of open space around it I suddenly see two looping arcs of stars forming the wings. With Sagittarius starting to sink, I made a quick run through the little globular clusters along the base of the teapot. M69 is a small, round fuzzy that’s not at all resolved but easy enough to see. M70 is similar to M69, a round fuzz-spot that’s even smaller. Bright round core, but no hint of resolution at all. M54, the third sister, is much like Ms 69 and 70. More than anything it looks like a small galaxy in the SCT: bright stellar core surrounded by round haze. I couldn’t resist any longer. Over to the east for what we called “The Great Andromeda Nebula” when I was a sprout. This huge galaxy, M31, stretches all across the field of the Tachyons. 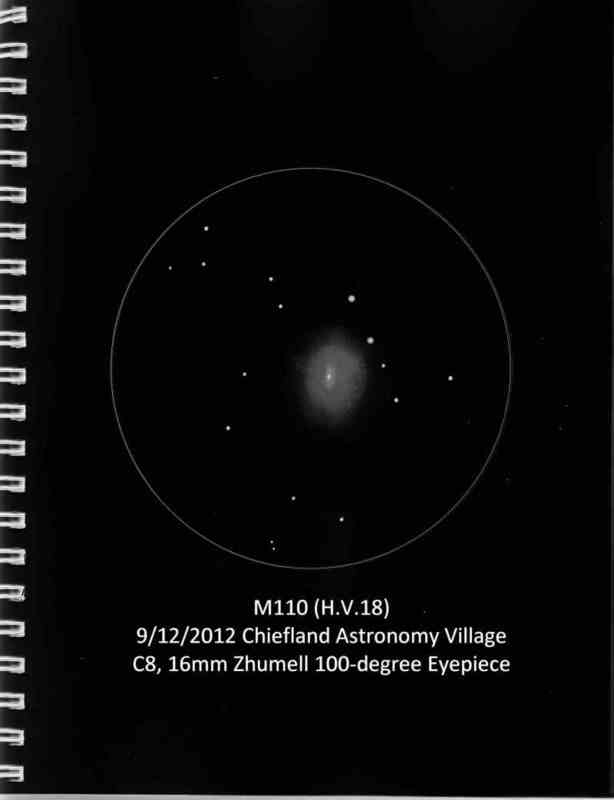 Satellite galaxy M110, which is normally a little subdued, is very bright. M32, the other, closer-in companion, is both smaller and brighter, appearing almost stellar. At least one of M31’s dark lanes is visible in the rapidly degrading sky. I even seem to pick out a little detail near the galaxy’s nucleus. The 3-D effect is pronounced here, if a little weird. To me, the galaxy seems to float in front of the field stars. M55, east of Sagittarius’ teapot asterism, is a globular I haven’t visited in a while. Must not have, anyway, because I was just floored at how big and prominent this thing was in the Tachyon binoculars. Not resolved, but looked like it wanted to. I convince myself I see a few of its outer suns wink in and out of view occasionally. Back east before the haze moving in erases the fall constellations. M33 is very good indeed in the 25x100s, if a little dimmer than it would otherwise be due to the haze. At first it’s just a milky oval with a brighter center floating among the stars, but a little looking and I begin to see its famous spiral pattern. 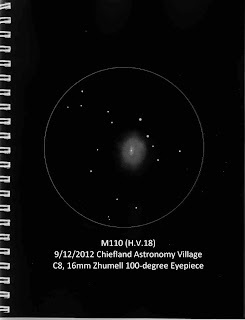 NGC 457. The E.T. Cluster is still in the clear, and this old friend is simply outstanding in giant binoculars. Cute little devil, surprisingly small, but set off by a very rich field as he waves at me across the dark light years. The Pac Man Nebula, NGC 281, is fairly easy to see in the Tachyons. But only fairly. It’s really not that obvious in the C8 either on this night. I only occasionally think I see a sign of the Pac Man mouth; mostly it’s just an ill-defined roundish smudge. The Muscle Man Cluster, Stock 2, is not one I look at often, and, as is often the case with open clusters, my reaction on getting it in the field of the binoculars was, “Huh, don’t look like no muscleman to me!” And just as typically, suddenly the little man with his upraised arms became obvious. At 60’ across this is definitely a binocular object and was well framed in the Tachyons. With M57 well placed, I thought I’d check to see if I could make it out at 25x. Yep, it’s there, looking more like a fuzzy b-b than a ring. M13 is up next. How is it? Alright, but it’s tight and not resolved. Bright, of course. M92 is about the same, just smaller and dimmer. Should have checked in on the looser M5, but he is gone now. M56 is high in the sky, but I was able to get this subdued and often ignored globular in the field without strain with the EZ Binoc Mount. Obvious if not overly impressive. Mostly a round smudge with a couple of stars suspected. Albireo, the Cub Scout Double is wonderful in the Tachyons, with its blue and gold components well-separated at 25x. Should have gone from here to the Veil Nebula, but I FORGOT. Dangit. The final object was M45, the Pleiades. The Daughters of Atlas were just barely high enough to bother with. Beautiful despite passing haze. Too many blue diamonds to count. Occasionally I think I see a hint of the Merope Nebula, but it is really like “baby’s breath on a mirror” tonight. You read about Friday night, night two of The Herschel Project Phase II, last week. Despite the fun I’d had with ‘em Thursday evening, I didn’t use the Tachyons Friday. I didn’t plan on getting them out of their case on Saturday, either. That night was to be more Herschel sketching since I hadn’t been able to do as much of that as I’d hoped Friday. On our way down to breakfast that morning, though, the completely overcast sky hinted that might not happen. What was on The Weather Channel was, as usual, a little ambiguous—“chance of showers, scattered thunderstorms,” but the forecast was looking worse than it had. Originally, Saturday was supposed to have been the best night of our four night run. Looked to me like a little sucker hole cruising with the Zhumells might be it, but that would be OK.
After breakfast, where I stayed away from the enormous waffles, it was time for the day’s road trip. Saturday is always Duma Key Day for me and D. Duma Key? 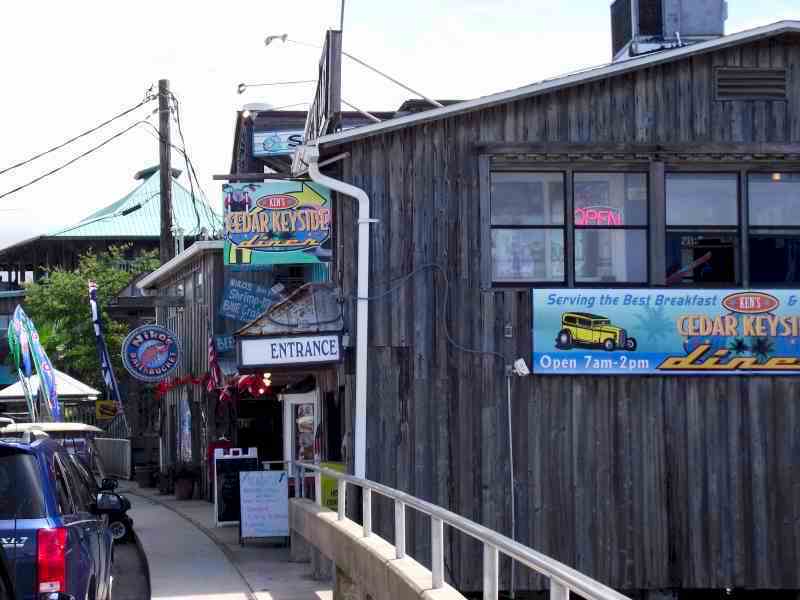 That’s just what Dorothy and I call nearby Cedar Key, a pretty little island fishing village chock full of cool bars and shops. 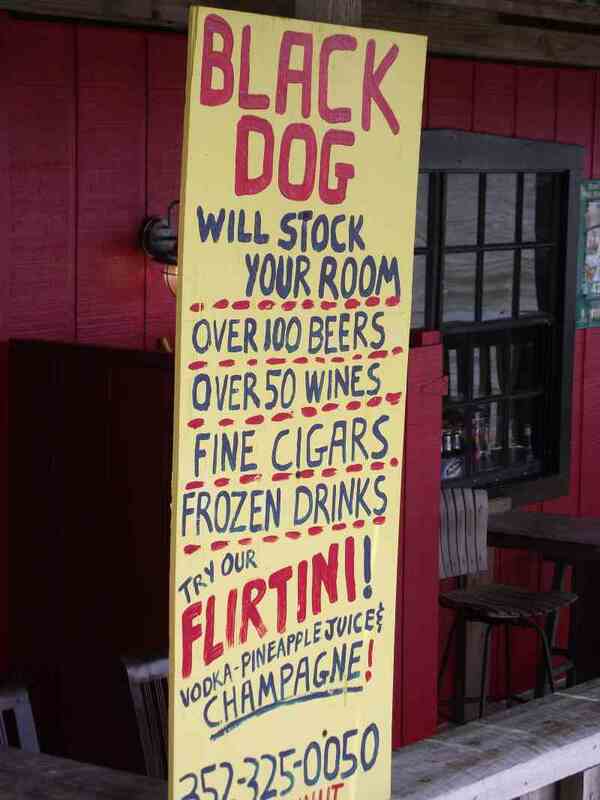 It ain’t scary like the setting of Stephen King’s novel—well, it might get a little scary after dark at The Black Dog when the Flirtinis begin to flow. What it most assuredly is is one of the Florida west coast’s forgotten jewels. It was lunchtime when we got to Cedar Key, so we stopped for a bite. One of our favorites in the past, The Rusty Rim Café, was sadly out of business, having been damaged by a fire last spring. I’ve heard it is under repair, but not much seemed to be going on with the place, and it’s not clear to me it will ever be back in its original form. It’s a good spot, though, and I am sure it will return as something someday. Our venue of choice this time was The Steamer, which serves what Miss D. believes to be the best crab bisque in the whole, wide world. I ordered a bowl and now agree. I also had the appetizer portion of fried shrimp, though I really didn’t need it after the rich bisque. Especially since the shrimp were monster-sized—“jumbo shrimp” ain’t always an oxymoron, campers. After lunch we made our customary tour of the shops. Unk looked at plenty of t-shirts and coffee mugs, but I really have a surfeit of both. I confined my buying to a Cedar Key shotglass and a Cedar Key beer cozy. Might as well get stuff I can USE, after all. 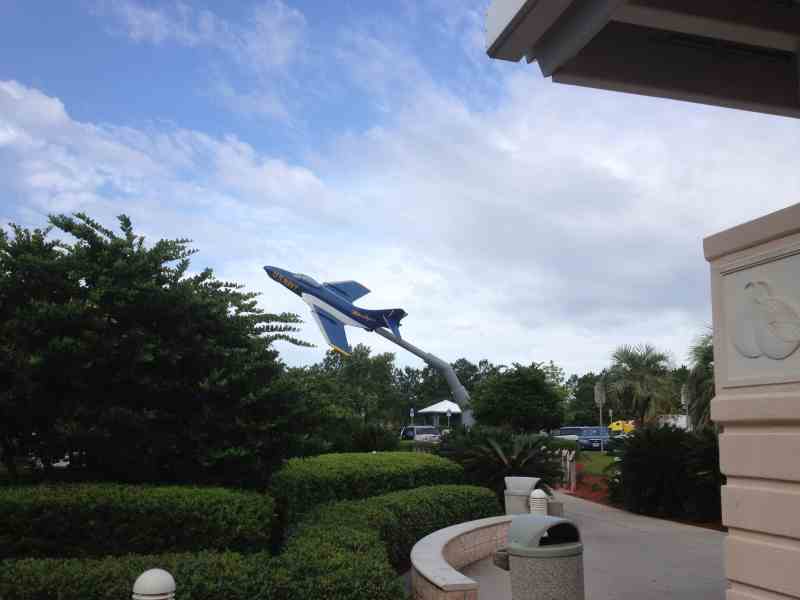 Shopping done, it was back to Chiefland to relax and keep watching the skies. The pea-picking clouds came and went and I thought there was a chance they might do what they’d done on Wednesday and dissipate after sundown. By 9 p.m., however, they were showing no inclination to do that. Hell, they seemed to be getting thicker. I hung out with my pals on the field and hoped for better, but our hopes were fleeting. Then, about 9:30, I noticed a substantial sucker hole had opened up to the south-southwest. I hurried over to my setup and got the Tachyons on their mount. The sky had looked so poor at sundown that I’d left them in their case and the C8 under her Desert Storm cover. What did I see? Brief glimpses of M8, M16, M17, and a few of the area’s impressive open clusters. When the clouds closed back in, I moved east, which wasn’t much better. I was amazed, however, that the binoculars showed the core of M31 through a fairly thick haze layer. And that was it, the last thing I saw Saturday evening. The sky then well and truly closed down with a nearly audible thud. But that, I reckoned, was OK. There was that looming drive home to The Swamp in the morning. I am always torn on CAV Saturday nights. Do I try to squeeze one last photon out of the sky or do I get some rest so I don’t feel like a zombie for the drive back west on I-10? There wasn’t much of a decision to be made this time, since it was apparent the sky wouldn’t get much better for a long while. Back to the Day’s Inn for a couple of brewskies, a little cable TV, and a little reading of the sometimes silly, often informative, and always fun give and take on the Cloudy Nights BBS. I hated to go to sleep on this last night of our vacation, but Unk’s eyes soon shut and soon it was Sunday morning and The End for another Chiefland romp. Packed the 4Runner, Miss Van Pelt, and headed out to the site for the inevitable gear tear-down and goodbye-saying. It had been a good one. Maybe one of the best. Saw plenty Wednesday and Thursday and even a little Friday and Saturday. Got some Herschel Project work done. Most of all, I relaxed and had a good time with Dorothy. As always, “Just want to come back soon,” muchachos. The title for this one could actually have been “Chiefland Redux, Redux, Redux” because what I did Down Chiefland Way and the reasons I did what I did were much like the way things were in this edition of the Little Old Blog from Chaos Manor South. What’s that, muchachos? I ain’t making much sense this Sunday morning? I reckon you are used to that, and I also reckon we should rewind and start this story at its beginning. 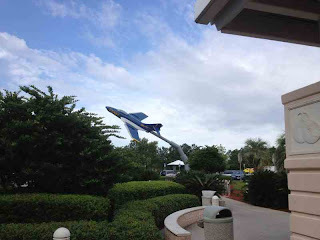 A few months back Miss D. mentioned we should plan some kind of a trip for our anniversary, coming up in September, so we tossed around a few ideas. Maybe duplicate our honeymoon, where we drove up the east coast to Virginia (which is appropriately for lovers). But this didn’t seem to be the year for a long road trip. Then, Miss Dorothy suggested we combine a Chiefland Astronomy Village (CAV) observing run with said anniversary trip. 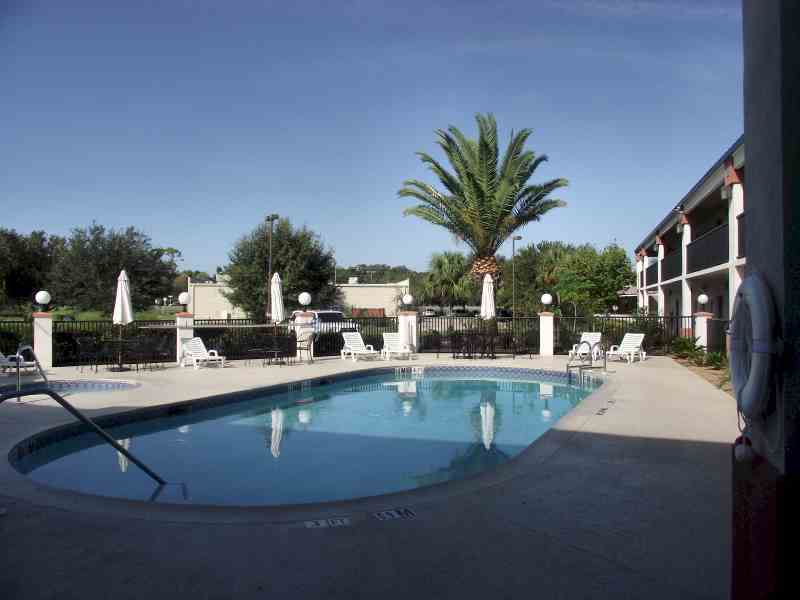 We’d observe the deep sky and also spend some time visiting the attractions of Florida’s Nature Coast. I suppose it’s possible somebody, somewhere has a wife more wonderful than mine, but I DON’T THINK SO. As our departure date, 12 September, approached, I started making big plans. This would be the perfect time to begin The Herschel Project Phase II. As y’all know, I have finished observing all the H-objects, but that doesn’t mean The Project is over. I still need to do some nice DSLR images of the best of the best, make plenty of sketches, and use the Mallincam Xtreme video camera to re-shoot quite a few of the aitches I captured with my old black and white Stellacam. I decided I’d tackle the first two tasks this trip, imaging with my Canon digital single lens reflex and doing some sketching. What would I do the picture taking with? My standard astrophotography rig, my Celestron Ultima C8, Celeste, and her Atlas (EQ-6) mount. Sketching? I’d do that with the C8 as well. 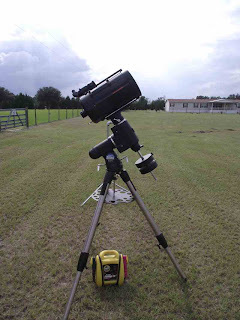 After all these years as a C8 owner, I am still a big fan and one of my missions is to show folks just how deep this “small” and inexpensive telescope can go. I was all set then? I thought I was, but then a couple of things changed. The first change was in the weather. As usual, the closer the trip got the worse the forecasts became. The 10-day for Chiefland started out impressively clear, but when we got within five days it began to go south with a lot of “partly to mostly cloudy.” That was not enough to make Unk change his observing plans, though. What was enough to do that was that I had to make a technical support visit to a ship in New Orleans the Tuesday before our departure. By the time I got home from NOLA Tuesday evening I was bushed. Somehow, I persevered, getting all the gear packed in the 4Runner. As I was finishing up, it hit me: “Rod, you are way too worn-out to spend hours messing with a DSLR.” Miss Dorothy encouraged me to simplify, too. Why not have a nice, relaxing visit down to the CAV now that the Big Enchilada was done? That sounded good to me, but I hedged my bets, packing the Canon Rebel in the 4Runner anyway. The more I thought about it, the more visual observing with a little sketching thrown in seemed the way to go. Which would make this run very much like the January 2010 “Chiefland Redux, Redux” trip. My condition this time was not as dire as then, when I was recovering from (minor) skin cancer surgery, but it was close enough. That trip to New Orleans coming not long after a sea trial onboard an amphibious assault ship had been enough to get me down, way down. I have finally had to admit I just can’t shrug off these things like I could when I was 30. In addition to dropping back to “jus’ lookin’ with Celeste,” there would be another similarity between the two CAV visits. In January 2010 I was all het-up to check out the CG5 mount’s new firmware for its NexStar hand control. This time I’d have the new (still beta) software for the Atlas’ GEM’s SynScan HC. Seems as Synta (who owns Celestron) is finally working to make the feature set of the SynScan more like that of the NexStar. The beta firmware adds an AllStar polar alignment routine (called “Polar Realign” for the SynScan) and several other tweaks. In case the skies degenerated completely to sucker holes, I thought it would be cool to have something along to allow me to cruise the deep sky without worrying about mount alignments and go-to computers. Could have been the StarBlast, but I was ready to finally get out with my “new” 25x100 Zhumell binoculars and the EZ Binoc mount Dorothy and I built for them. What with the weather and my Herschel obsession over the last year, those giant binoculars had done nothing but sit in their case. It was so nice to have Miss D. along for this CAV venture—she missed my July expedition—and to be back to our usual routine. Bright and early—but not too early—Wednesday we got up, packed our suitcases, and made it out the door just a little past 8. 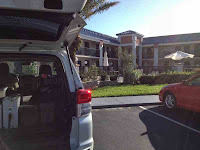 Didn’t want to leave too early, since check-in time at our nominal Chiefland camping ground, The Day’s Inn, is now 3 p.m., engendered, I suppose, by the motel’s need to cut back on housekeeping staff in these economic hard times. Anyhoo, before hitting I-10 for the five-and-a-half-hour drive we stopped at our local downtown Mickey D’s for breakfast. Prob’ly don’t have to tell y’all what I got: chicken. Fried chicken. On a big biscuit. With grape jelly AND ketchup on it. Hell, y’all, I was on vacation. Following our repast it was head west on I-10 time with the Real Jazz channel punched-up on the dadgum XM satellite radio. Made our customary stop at the Florida Welcome Center outside Pensacola, and, as I was browsing the racks of tourist brochures while waiting for Miss Dorothy, it came to me that it was a dern good thing I had decided not to do any DSLRing. I couldn’t have done any if’n I’d a-wanted to. While I had thrown the Canon in the truck, I forgot the case with the guide camera, my Orion StarShoot, in it. Oh, well, I reckoned the astro-gods were just underlining that I needed to take it easy this time. The trip down was absolutely uneventful, with my only comment being that it sure went faster with Miss Dorothy at my side than it had when I was all by my lonesome back in July. It wasn’t long before we were exiting I-10, stopping at our usual Sunoco station for gas and snacks, and getting on the Florida – Georgia Parkway, Highway 19, the gateway to The Nature Coast and the Chiefland Astronomy Village. In addition to Miss D’s company, there was another nice change. Instead of heading into towering clouds as we drove south, we appeared to be leaving them behind. I wasn’t sure how much observing I’d get in Wednesday night, but it sure looked like I’d get some, and there wasn’t much doubt we’d at least be able to set up the gear, unlike the last time Dorothy was with me. That’s what I thought, anyway, but when we got within about 20 miles of C-land, it began to rain. It was heavy at times, but seemed more like scattered showers than an advancing front, and it at least washed some of the consarned love bugs off the truck. 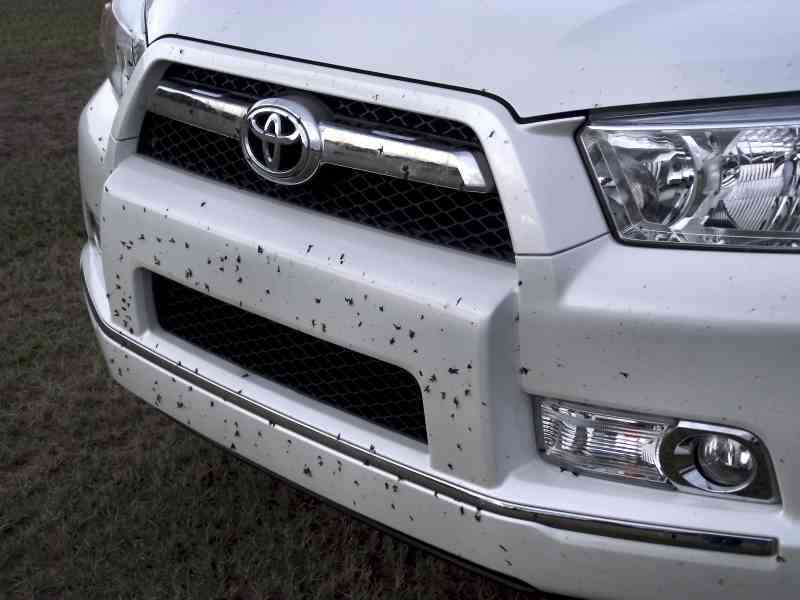 I don’t believe I’ve ever seen more love bugs than we encountered this time. We ran through literally clouds of the little suckers all the way down 19. We arrived at the Day’s Inn just after three and checked in. 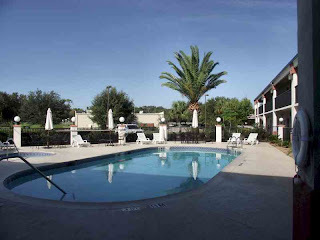 Dorothy and I were back in our usual first floor poolside room, and it and everything else was just the same as always: clean, not fancy, but sufficient and mucho bettero than a tent. What next? Sticking to The Plan, we headed for the CAV. It was sprinkling in-town, but it looked to us as if the shower was of the very local type. To the south we were seeing plenty of blue sky. And so it was. It was not raining and had not rained at the CAV. Like the motel, the astronomy village was Just the Same, just the way I like it. The field had been freshly cut and the air was delicious. Even better, it was obvious I would not be on the field alone on this night. Our friends John and Bobbie were setting up their scope, and the trailers of several of our other buddies were on the field. It would sure be nice to have some company Wednesday evening. Set up went purty easy. One other person makes getting the EZ up canopy (actually we use a Coleman these days) EZ-er. Scope? Celeste is nothing, but there is no denying the Atlas mount’s head is a handful at a bit over 40 pounds. Nevertheless, it was considerably easier to get on the tripod than my fork mount NexStar 11, Big Bertha, is. The binoculars? I unpacked the EZ Binoc mount, but figured I would leave the glasses in their case till Thursday night. Tonight would be all Celeste, to include a full check-out of her “new” hand control. Worked up a bit of a sweat, but not too bad. A breeze was blowing and the mercury hadn’t climbed past the upper 80s. E’en so, it was nice to get back in the 4Runner, crank up the A/C, and head to Wal-Mart to execute Part Three of The Plan: stock up on supplies we hadn’t brought with us. That included the usual items: MONSTER ENERGY DRINKS—natch—Jack Links (their beef sticks since the Flaming Buffalo Chicken Nuggets seem to have disappeared), bottled water, Kolorado Kool-aid for after run libations, and some granola bars for the field for comparatively healthy late night snacking. Before leaving, I snagged yet another Star Wars t-shirt to add to my wardrobe of observing field wear. After shopping, it was time for a bite to eat, since the clock was saying it was now past five. With Wally-World’s in-store Macdonald’s gone (looks like they may be in the process of building a new fast food stand), we headed for the Taco Bell next to the Day’s Inn. Against my better judgment I got the Dorito Taco Big Box. I simply could not resist, y’all. Slathered everything in the Taco Bell Hot Sauce I favor, gobbled it all up, and we headed back to the motel. After allocating our purchases to the room or the truck depending on whether or not they needed to go to the field right away, and having a quick peek at the sky’s layout for the night on the laptop with Stellarium, it was getting on to seven and I needed to high-tail it to the observing field. Yeah, the scope was set up, but I still had to get the laptop going. Even though I did not plan to operate the mount with the computer on this night, I would still need it to run SkyTools 3 so I’d have a list of objects to work. Out at the site, I scrambled around getting everything just so before taking a break just after sunset and turning a weather eye on the sky. Not bad. Why, not bad at all. The clouds I’d hoped were just afternoon clouds had turned out to be just that, and were drifting west toward the Gulf of Mexico. Looked like it was going to be a nice night and maybe even a long night. Relatively speaking, anyway. In mid September it wouldn’t get good and dark at the CAV till after 9 p.m.
All that remained to do was get my power squared away. There’s AC on the field, and that runs the laptop, the dew heaters (via a little 12vdc power supply Unk has had for years), and normally the telescope/mount. I’d intended to power the Atlas with AC, anyway. It’s only been the last couple of years that I’ve begun running the scopes on mains current at CAV, and since I had not had the Atlas down to Chiefland since '08, I had no AC supply for the big dog. I couldn’t find a wall-wart around the Old Manse with the current-handling capacity of Orion’s Atlas power supply, so I figured I’d better just order their (fairly reasonably priced) unit. That wasn’t all I ordered. Our Cupertino friends had been advertising a larger accessory tray for the Atlas tripod. I don’t put eyepieces on an eyepiece tray, but I do find a big one helpful for holding the dew heater power supply, a surge suppressor, a can of Monster Energy Drink, and other stuff. So I ordered that too. In just a week or so, a box from Orion was on the front porch. I was suspicious, however. Looked too flat for a power supply wall-wart to be in it. Indeed there was none. There was a note on the shipping list that said the wall-wart would ship on that very day. Which meant it would not arrive till the Friday after we left for Chiefland. Oh, well. I’d power the Atlas with a jump start battery. No big deal. HOWSOMEEVER…as a regular customer, I notice that a lot of Orion’s stuff seems backordered these days. And I am hearing complaints about that from lots of folks. Hope we are not going back to a time like the early 90s when you couldn’t order a dern Kellner eyepiece from Orion without it being on pea-picking backorder. How about the tray? Works good and is, I guess, worth its somewhat exorbitant price. I was surprised, however, to find that, rather than replacing the Atlas tripod’s normal accessory tray, it bolts on to it (they tell you that on the Orion web page, but I reckon I missed it). Not that that makes a big difference, I suppose. Just a little strange. I guess the tray would have had to be heavier and thicker to replace the original. At any rate, it did the job I wanted it to do, providing a nice large surface for my assorted at-the-scope stuff. With the bright stars winking on, it was time for your old Unk to get on the stick. While I planned to use the hand control’s new AllStar style polar alignment, I wanted to be in the neighborhood of the pole to begin with to make tweaking with the HC as quick as possible. Before starting the Polar Realign business, I’d do a normal polar borescope alignment. 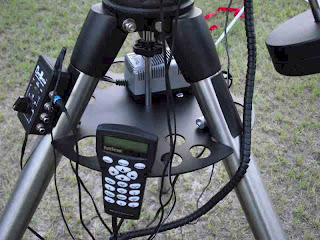 The easiest and most effective way to use the polar scope involves nothing more than it, the mount’s R.A. setting circle, and the hand control. Start out by putting the North Star in the middle of the borescope’s field. Rotate the mount in R.A. until the circle on the reticle where Polaris goes is on the bottom, and set the R.A. circle to 0. Turn on the mount, enter time and date and position, and observe the Polaris Hour Angle the HC displays. Then, unlock the R.A. axis and move the mount until the R.A. circle (top scale in the Northern Hemisphere) reads that value. Lock it down. Move the mount in altitude and azimuth until Polaris is in the circle on the reticle. Voila! Pretty good alignment. It would have been more than good enough for my visual observing, but I still wanted to try the AllStar bidness. Alrighty, then. Go-to alignment next. Let’s see, star one…howsabout Alpheratz? Turned the mount back on, re-entered all the setup info, and began the three-star alignment. Finally found my star of choice in the list, centered Alpheratz up, and told the Atlas to go to Star Two. That was where things got different. I thought Alderamin might be a good #2, and figured I’d have to scroll through a long list to find it. Nope. It was there, but was one of only two choices. In the past, you had to make the decisions on the best alignment stars yourself, unlike the NexStar HCs, which only present good choices. Apparently the SynScan controller is now doing the same thing, filtering stars by their ability to produce a good alignment. Anyhoo, accepted the HC’s first pick for the third star, Arcturus, and I was done. The question then became “How well done?” In the past, allowing the HC to choose its own alignment stars has resulted in very poor alignments. Not this time. Everything I requested all night long was somewhere in the field of the 13mm Ethos and often in the 8mm at f/10. Yes, those are ultra wide field eyepieces, but go-to quality was good enough that I suspected most if not all my targets would have been on the small chip of my Mallincam Xtreme. Which brings us to the eyepieces I’d use on this night. I love my big 8 and 13 Ethoses, but I also wanted to give my el cheapo 16mm Zhumell 100-degree job a try. All these eyepieces would ride in a very special star diagonal, my Denkmeier Power Switch with Filter Switch. That rig allows me to instantly switch the C8 between f/10, f/20, and f/6.6 AND…it lets me put either one of two filters into the light path. Having the Denk’s filters, Barlow, and reducer available at the flick of a switch means I do a lot more experimenting with various magnifications and filters than I normally would. Before doing any deep sky cruising, I wanted to try the automated polar alignment routine. Since I’d experimented with AllStar a time or two, I knew how the SynScan’s Polar Realign should work. Pick a star from a list, usually one to the south and near the intersection of the Celestial Equator and the Local Meridian. Slew to it. Mash a button and the scope slews off it. Adjust the mount via its altitude and azimuth adjusters till the star is centered and you are done. One of the stars the Atlas chose was Antares, which was reasonably well placed, so I OKed it. As above, the scope slewed away after I’d centered it. The star landed not too far from the center of my Orion 12mm reticle eyepiece when the slew stopped, which, I thought, indicated the polar scope did a pretty good job. Re-centered with the alt/az bolts, and, as instructed, went on to a new 3-star go-to align using the original three stars. When I was done, the HC indicated via a read-out of “Mel” and “Maz” that I was about 15-minutes from the NCP. I could have done another Polar Realign followed by another 3-star to dial the pole in closer, but I’d accomplished what I wanted—I’d proved to myself that the new procedure at least seems to work. It’s hard to tell just observing visually, but the quality of my go-tos and lack of egregious declination drift suggested Polar Realign is ready for prime time. Mount alignments up done, it was now approaching 2130 and good and dark and time to have some fun. I did a few spurious go-tos to check accuracy, which resulted in M13 in the west, M22 in the south, and M82 in the north all being easily in the field of the 16mm Z. I stopped at M13 for a while to give the 16mm a good try-out. A globular’s hordes of tiny stars are a challenge for any wide-field eyepiece, but the 16 Z acquitted itself well. Especially at f/10, the stars were decent almost to the field edge. No, they were not as good at f/6.6, but the Denk reducer does not claim to be a field flattener. Final verdict? The eyepiece produced acceptable views, was very useable, and didn’t break the bank. After that? I couldn’t resist hanging out down south for a while, visiting the sinking faves of summer: M8, M17, M16, M22, M11, and all the rest. The night’s skies had started out a little iffy, but were now fairly cooking. The Milky Way’s “steam” was boiling out of the teapot’s spout. Frankly, I wished I’d gone ahead and set up the 25x100 binocs, but that would wait for Thursday night. Now the time had come to get back on the Herschel bandwagon. I started out easy with M110, which is indeed a Herschel, sketching this elliptical companion of M31. How do I sketch? I don’t claim to be the world’s gift to art, but I do have a system down. I draw in a sketch diary, a spiral bound notebook of good drawing paper easily available in art supply stores or even drug stores. I draw with a variety of pencils, mostly a medium hb. A Sharpie-type marker does the stars. How do I see what I am sketching? I use a gooseneck red LED light I got from Astro Gizmos a while back. This is clamped to the Rubbermaid Storage Clipboard that supports the sketch diary. How do I sketch? 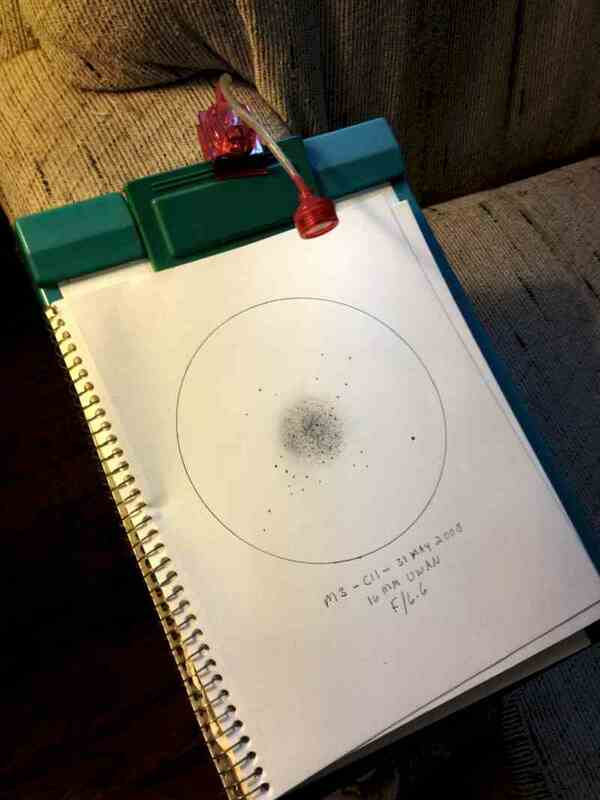 I start with the Sharpie, plotting the field stars with larger dots for brighter ones, natch. I don’t necessarily draw every star, but I do enough to allow me to accurately place the target object in the field among them. Stars done, I pick up the pencil if I am doing a galaxy or nebula, or continue with the sharpie for a glob or open cluster. I certainly don’t draw every star in a globular or even in a rich open cluster, just enough to give the general impression. I will usually go back to a pencil, a hard one, for dimmer globular stars. I indicate nebulosity in all objects both by sketching it in and by drawing outlines. I also make notes about the object on the paper. The goal is to have enough data to be able to come back and make a finished sketch later. I complete my drawings by daylight, trying to get to them while I still have a good memory of the objects’ appearances, maybe within a week of the observing run. I indicate stars with small dots and do nebulosity with soft pencils, charcoal, an art gum eraser, and blending “stumps.” I strive to render the details I saw and only the details I saw, not those I remember from images. When my sketch is as good as I can get it, I scan it into Adobe Photoshop, render the stars in their proper sizes/brightnesses with the airbrush tool, and do any needed touchups to nebulosity using a variety of the program’s drawing and painting tools. When I am finished, I reverse the picture’s colors, making it a negative image so I have nice white stars on a black background. So what did I sketch? Enough objects but not too many. Didn’t want to burn out on the first night, but I did want to cover some ground, and ended up doing fifteen Herschels. Let me tell y’all, it’s a lot more work to draw fifteen aitches than it is to image fifteen with the Mallincam! When I finished my sketching, I wasn’t even close to being ready to call it a night. I zipped all over the sky doing tons of pretty stuff. What were some of the standouts? One was NGC 7331, The Deerlick Galaxy. It had been a long time since I’d seen it look as good in a mere 8-inch. Not only was its sweeping spiral arm there, I kept staring and was able to pick out a couple of the “deer,” the little NGC galaxies clustered around big mama—a good job for a C8. Another winner was M15. I never tire of looking at its spray of miniscule stars and its tiny, condensed core. Even at the relatively low power of the 16mm eyepiece at f/6.6 a goodly number of the cluster’s stars were resolved. So it went for the next few hours. At about 1 a.m., I found myself a little weary—though not as weary as I thought I would be by that time. I hopped over to the clubhouse, got my second Monster of the evening out of the fridge, chugged it down, and was ready to go—hell, raring to go—again. Still, by the time 2:30 in the freaking morning came around, the Day’s Inn was sounding better and better. I threw the Big Switch, put the computer in its bag, and headed back to town. No shame in that. In addition to sketching fifteen objects, I'd visually observed at least fifty more, though some only briefly while checking the Atlas’ go-to accuracy. Friday morning brought a fresh batch of clouds and another Day’s Inn motel breakfast. “Hey, wait a minute, Unk. FRIDAY? What happened to cotton-picking Thursday?” You will hear all about Thursday next week. That was the night I let the Zhumell binoculars loose on the summer Milky Way, and it was incredible, but I didn’t do a lick of Herschel work, and The Herschel Project is what this entry is ostensibly about, y’all. I trotted down to the lobby with Miss D., resolving to stay on the healthy side before my digestion began protesting all the junky road food I’d consumed over the past couple of days. Bowl of Frosted Flakes (née Sugar Frosted Flakes). Half a plain bagel. Orange juice. I did have an ulterior motive. I was saving room for lunch at my fave Chiefland eatery, Bar-B-Q Bill’s. Before Bill’s, Miss Dorothy and I had a road trip on our itinerary. 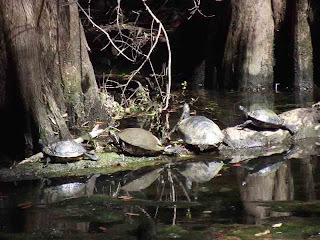 We motored a few miles south from Chiefland to Manatee Springs State Park. We’d been there before and were anxious to do some more walking on the cool and shady trails. No manatees did we see, of course—they are strictly winter visitors—but there were plenty of mullet, who had been driven up into the springs by Hurricane Isaac. Every few minutes a fish would jump, landing back in the water with a startlingly loud splash in the quietness. 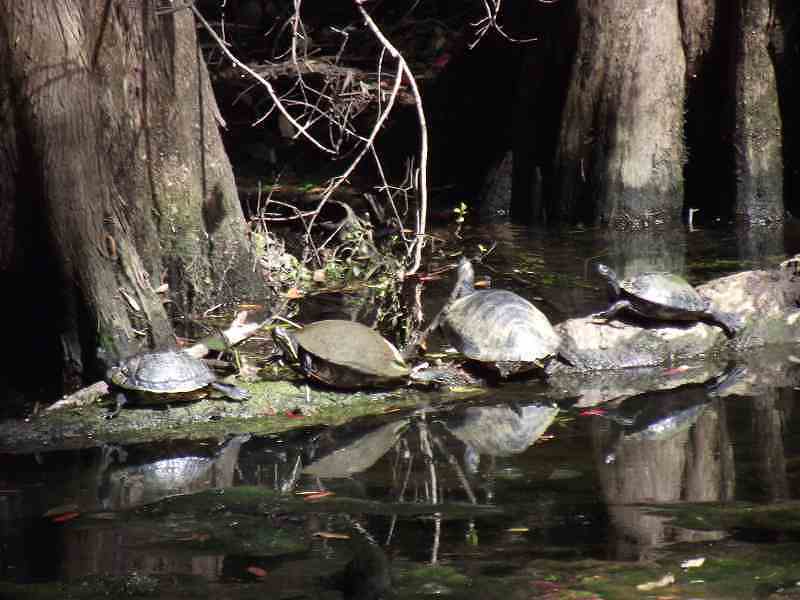 In addition to the fish, there was plenty of other wildlife from beautiful birds to a group of turtles sunning themselves. It was a pretty day and we had a good time walking down to the Suwannee River. Loved the park, but I was more than ready for Bill’s when lunchtime came. 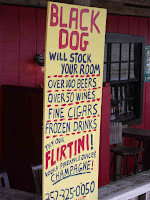 I won’t belabor the subject; I’ve raved often enough about what I consider the best barbeque joint in the southland. I will just say “good as ever.” Or maybe even “better than ever.” D. and I ordered the same thing, the storied lunch special: pork (beef if you prefer), fries, beans, garlic bread, salad bar. All for a crazy small amount of bucks. As always, the old-fashioned salad bar was a big hit with me, though I tried to go easy on it so as to leave room for all that barbeque slathered with Bill’s insane spicy sauce. Thence back to the motel where I did some resting and catching up on my reading of Astronomy Magazine after a dip in the pool. Surprisingly, the water was on the chilly side. Summer is going, even down in Chiefland, alas. As y’all know, Sky and Telescope is tops with me and would be even if I didn’t write for it, but I still like Astronomy. Dave Eicher and company are doing a good job, still. Sadly, busy as I am the magazine often gets shoved onto the “read later” pile. I was happy to finally spend some time with their last four or five months’ worth of issues. At 7 p.m. it was time to return to the fabled Billy Dodd Memorial Observing Field. Not that I had high hopes. As the afternoon had grown old, the clouds had multiplied and this time they were not drifting off as sunset came and went. Sucker holes and haze and nothing but. I contented myself with messing with the SynScan firmware, which I found I could confusticate if I tried. Since the software is still in beta release, I would expect some rough edges, and that is not a down-check as long as they round ‘em off in the final version. When I was doing the AllStar alignment, I’d noticed some rather odd star choices. Yeah, it’s supposed to be “all star;” you should supposedly be able to use any star in the sky as a polar alignment helper. But, still… Mizar? Choosing that as my Polar Realign Star resulted in Celeste pointing at the ground rather than at the star and doing the same when I aborted Polar Realignment and sent her to M13. I redid the Realign on Antares to make sure the routine wasn’t busted and then did some playing around with alignment star choices. While the SynScan is well on its way to providing good stars automatically, it can still pick baduns. Accepting Arcturus as my first star resulted in the HC offering Vega, which was nearly overhead and close to the Local Meridian, as an option for star number 3. Permitting that led to all targets being away from the center of the 16mm Zhumell’s field and some in the northeast area of the sky being out or nearly out of its field. The amazing thing was that even given the poor choice of Vega as the cone-alignment star, most objects were at least in the field. After I was done messing around, I performed a 3-star alignment one last time, on a whim using Alkaid as the number three star rather than Arcturus, which resulted in the best alignment of the trip, probably because it was, unlike Wednesday night’s Cone Star, within the suggested 30 – 70-degree (north or south) declination range. Everything, every single object from horizon to horizon, was dead center in the eyepiece without fail. Final thoughts on the SynScan HC? I don’t think the beta firmware is quite there yet, but the SynScan is well on its way to being the equal of the company’s NexStar. I never had to worry about getting objects in the field, and based on my experience and what I’ve been told by other folks, I believe the Polar Realign function works. What do I still miss? A list of named deep sky objects would be nice and so would some fine-tuning of alignment star choices, but other than that it all seems to have come together. That said, I still prefer EQMOD, but it’s nice to have the option of a fully functional, mature HC for those times when I don’t want to use a PC in the field. So, go-to was real good. What did I look at? I did five more Herschel sketches, but getting even that many took most of the night, since I had to do a lot of waiting for clouds to pass. When I couldn’t get at a Herschel, I looked at pretty stuff or cool stuff or memorable stuff. Best sight of the evening? M31 riding high as seen in my old 35mm Panoptic eyepiece. The galaxy’s nucleus was a tiny burning pinpoint, there was a dust lane on view despite the not so hot conditions, and M32 and M110 were crazy bright. In between looking, I spent a lot of time hanging out with my Chiefland buddies. It was almost like we had a real star party going on, with the crowd having grown to at least ten observers by Friday night. 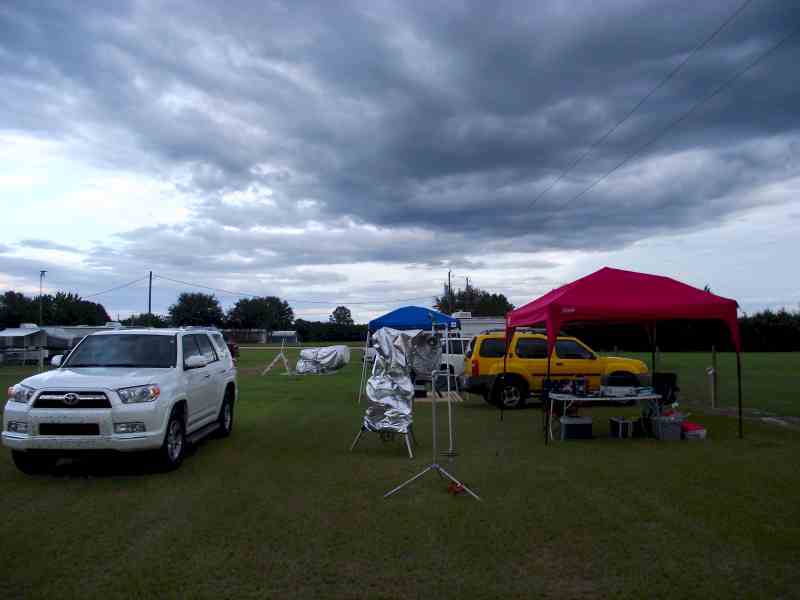 In addition to shooting the breeze, we did plenty of checking of the Clear Sky Clock and the Weather Channel thanks to the wireless Internet on the field, trying to determine what Urania planned to do with her sky. What we could see above us and what was on the I-net seemed to suggest the clouds might scud off after midnight. How long after midnight? That was hard to say and, dadgum it, Unk was feeling tired again. Having to wait for long stretches between sucker holes was getting me down. At 12:30 I disgustedly threw in the towel and threw that accursed Big Switch. I knew good and well the sky would probably turn beautiful ten minutes after I left, but it wouldn’t be the first time that’s happened. Back at the motel it was a traditional denouement with the Ghost Adventures crew of Zak, Aaron, and Nick hanging out at a scary old abandoned insane asylum. That, a little Yell, a little web surfing, and I wound it down. It seemed odd not to be signing off with, “Another 100 Herschels done,” but I’d gotten some Project work accomplished to the tune of about 20 sketches between Wednesday and Friday night, and seen a few cool things despite the fricking-fracking weather. Most of all, I’d had fun, which, believe it or not, muchachos, is still the most important thing for me in amateur astronomy. Nota Bene: If you'd like to see more pictures of our CAV trip, you will find plenty on Unk's Facebook page. Not a FB friend of mine? Like good, old George Takei I have never been known to turn down a friend request. Unk needs all the friends he can get!